7677 Origami Peace Cranes for Japan!!! This project was incredible! Not only did we participate in a worldwide effort to help the children of Japan, but we also had a ridiculously fun time doing it too. A huge thanks to the Bezos Family Foundation and Osh Kosh B'Gosh for bringing this opportunity to us and other students all over the world. Background: When a massive earthquake and devastating tsuname struck Sendai, Japan in March of 2011, two organizations decided to find a way to have kids from all over the world participate in helping those suffering in Japan. Foundation - $2 for each crane received - to Architecture for Humanity's reconstruction efforts in Japan. April 1st and 8th, 2011.
anonymous donor contributed $100,000 to the effort. Now it's $500,000 for Japan! pieces. That is $1.5 million dollars worth of clothing. on the Origami Crane Sculpture in Japan!!! final touches on the Sendai Paper Crane Sculpture. 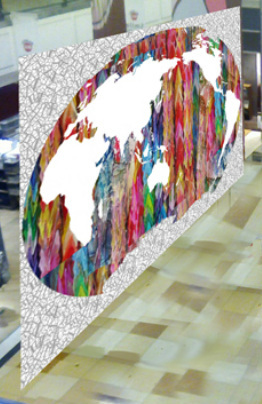 One key element of the sculpture is a paper crane world map. Dozens of cranes compose a series of vertical streams -- together, they represent the world of support received through the crane making project. Below: This is a five minute film that chronicles the creation of the renowned artist Vik Muniz's sculpture Large Paper Crane. It is the story of the collaboration of the artist and the students he invited to his Brooklyn studio to create a work of art celebrating Paper Cranes for Japan. Right: Pictures from Osh Kosh Bgosh's Cranes for Kids program to provide new clothes to the children of Sendai, Japan.